If you've never seen this, now you can say you have. But most of you have probably seen this before. I now present you with an old classic, YouTube sensation Brian Collins, the Ball State alum, with this train wreck of a sportscast for his college TV station. I recently spent some time with a good friend who I will call Al. Al is a former police officer who is now retired. Al had one of those very first satellite dishes, you know, the ones that were enormous and you had to have built in your backyard? Back then if you were watching TV via a satellite dish, you not only got the program you wanted, you also got the off camera interaction while the station you were tuned to was playing commercials. What you are about to watch is never before seen footage of former CBS anchor Johnny Morris, as he anchors a post game show following a Bears victory over the Minnesota Vikings. The date is October 9, 1988, and the win moved the Bears to 5-1 with a game against the Dallas Cowboys coming up the next week. 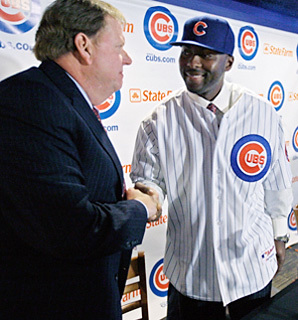 The non waiver trading deadline of July 31st is rapidly approaching and their is much speculation about what the Cubs might do or not do to improve their up and down club. Obviously GM Jim Hendry would like to add a bat to improve a struggling offense but the first question that has to be answered is what bat do you target and where do you play him in the lineup? In today's Chicago Tribune Cubs manager Lou Piniella talked about his team's need to add a left handed bat. Wasn't that what the Cubs set out to do last winter when they dramatically reshaped their roster to clear enough salary space to add Milton Bradley? Here is the cold reality: White Sox rookie Gordon Beckham who made his major league debut on June 4th has 2 more RBI's than Bradley entering play today. Cubs outfielder Micah Hoffpauir has 5 more RBI's in 53 less at bats than the 10 million dollar man and 2B Mike Fontenot has 8 more RBI's than the left handed run producer the Cubs added last winter. Bradley has been nothing short of brutal at the plate but with 21 million dollars left on his contract after this season the Cubs are stuck with him. So if he can't be moved what options does Jim Hendry have to improve his team? The only positions that are open for discussion are either 2B where the available options include Pirates standout Freddy Sanchez who's contract status could be a problem with the ownership situation still unsettled. Sanchez is hitting .307 with 6 HR's and 34 RBI's and he has an OBP of .346. He is an excellent defensive second baseman and at age 31 he has plenty of baseball left in him. However, Sanchez has an 8 million dollar club option for 2010 and after 2010 he will be a free agent which means that if you give up a lot to get him you need to get him signed to an extension at some point in the not too distant future. The price will be extremely high especially because the Pirates would prefer to trade him outside of the NL Central. Other options for Hendry could be to improve his bullpen with a situational left-hander but the problem there is that the price is exorbitant for mediocre players. One guy that Hendry would love to bring in is Baltimore Orioles standout George Sherrill who can set up and close and is holding left handed hitters to a .125 batting average. However, former Cubs president Andy MacPhail is a notoriously tough guy to make a deal with as the Cubs can attest to in their failed attempt to land Brian Roberts last season. How much would you pay to land a left-hander who is not the final piece to winning a championship? The only other spot that the Cubs can add a player is in center field but with 2 more years left on Kosuke Fukudome's deal at 26.5 million dollars the chances of him being moved are non existent unless the Cubs eat most of the salary. He has looked better since moving to the lead off spot but a punch and judy singles hitter for 48 million dollars was not what the Cubs envisioned when they signed the Japanese star. Here is a Video You Will Enjoy! WWE Star Goes Off! WWE superstar Randy Orton was being interviewed by a Spanish TV reporter. He is a big dude and threatens to pound the the little TV man into little pieces. Can someone get this guy a chill pill! Enjoy.